The Beating of the Wings is a rare breed of record, building a sonic bricolage from moody glam cabaret and early 80’s coldwave with an injection of Nine Inch Nails ire. The gentlemen in Revel Hotel don’t deal in irony: they wear their dark and damaged hearts on their sleeves, both lyrically and musically. At first listen, it’s singer Johnny Quinlan's full throttle bravado and sweeping piano melodies that light the torch songs on the record. Lyrically, he doesn't shy from bombast and incorporates a healthy dose of grandeur, deftly dropping lines about god, prophets, and power, even on the dancefloor ready tracks. 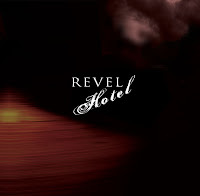 Catch Revel Hotel’s CD release show tomorrow @ Crash Mansion or get yourself a copy over at CDBaby.